“As a practicing gastroenterologist, Dr. Struble’s book is a breath of fresh air. The clever cartoon illustrations are just what children need to have fun while learning something profoundly important. There is so much negative advertising for children’s food choices. Therefore, it is nice to see an influence for positive change in a child’s diet. Of course, this the opposite of commercially touted diets. It is so hard to convince Americans that cow’s milk is not a healthy food and that dairy products cause many of the chronic health issues we face as a country. Recently a publication discussed why dairy products are so addictive and have such a role in obesity and diabetes. According to this, they contain a mild narcotic referred to as caseo-opiates. Casein is a milk protein and opium-like substances are attached to it and therefore contribute to the popularity of foods like pizza. “Dr. Struble provides us with age appropriate imagery for what is for the most part, taboo territory. The gut. We all implicitly get the connection between nutrition and health but how are we ever going to get this across to young children? Well here we have it. Laid out carefully with respect, humor and the facts of the matter, Dr. Struble eloquently demystifies complex uncharted territory. She bravely shows us a way of educating kids about their bodies – taking charge of what goes in and what comes out! She also made me laugh! This book is so much fun to read! I say that as a parent and as a physician. 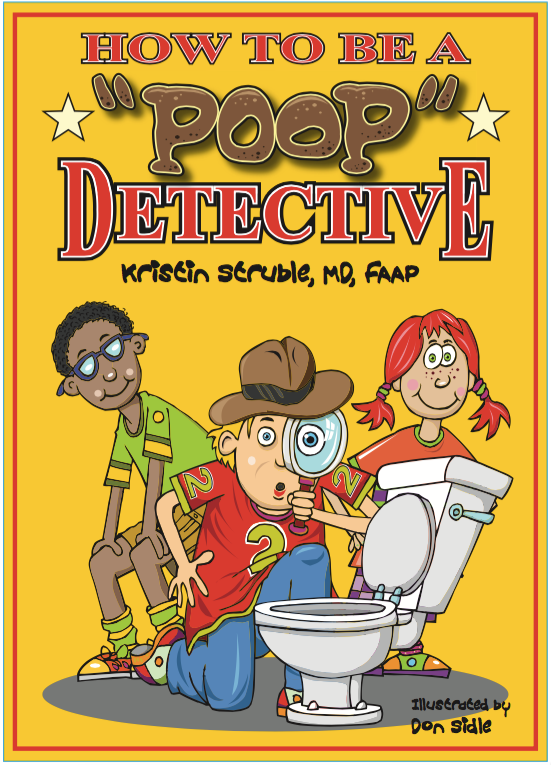 How to be a “poop” detective is also, and more importantly, fantastic for our children. Since this bodily function occurs in everybody, every day, but is taken for granted, this book gives it credence. Many children, and for that matter many adults, have problems that relate to poop or whose poop tells the story of other problems. Since this is usually a private matter, most kids are taught not to talk about it. That leaves a very important topic poorly addressed. This book takes care of all of that. The illustrations are amazing and Dr. Struble directed her wonderful illustrator well. Accordingly, the book is easy to read, rolls right along with the pictures, and creates an opportunity for conversation. That is exactly what a children’s book should do. Additionally, this book lends itself to be read multiple times. Finally, for the parents, the last page of the book tells us to not miss the parent companion book, (apparently coming out soon), “How to Become a Parent Poop Detective”. Looking forward to it. it. The concept of 5 S’s is applicable not only to kids but adults as well. copyright © 2013-2019 kristinstruble.com | Kristin Struble, MD.